Boas-Red Tail - Why is his head wrinkly ?? Why is his head wrinkly ?? dehydration or just about to enter shed cycle...most likly shed cycle. Dehydration, definately. His tank is too dry- he needs higher humidity. Get yourself a hydrometer (available at pet stores) and keep it at 55%, bump up to 60-65 during shed cycles. (This can be done by adding soaked moss, placing a large water dish under or above a heat source, or using dampened coconut hull fiber bedding, squeezed out so its like a sponge) You dont want it TOO humid or it can also cause fungal issues. 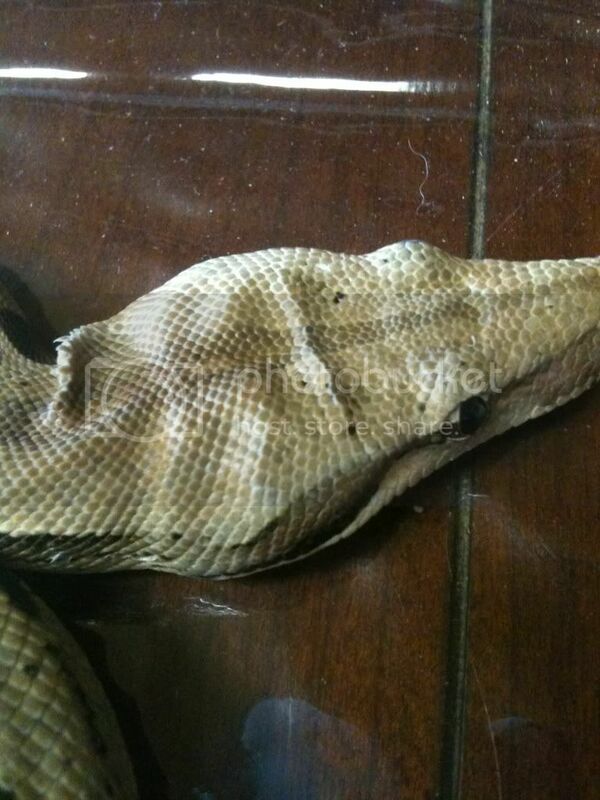 Having it be correct will help shedding, prevent respiratory issues and keep the snake healthy! Make sure to clean the water often (2-3 times a week) to keep bacteria down in the tank. Boas are susceptible to Lung infections otherwise.